In the 2014 financial year, consolidated net sales at Micronas Group increased 4.3 percent on the previous year to reach CHF 158.5 million. After adjusting the sales figures to exclude the discontinued dashboard controllers, the increase was 8.1 percent. The main contributors to this growth were the Asia region with CHF 92.9 million of sales and 3.5 percent of the growth, and Europe with CHF 51.6 million and 2.1 percent. In Europe, thanks to a targeted strategic expansion of marketing and sales operations, sales growth excluding the old dashboard controllers came to more than 15 percent. The gross margin for the year under review was 31.8 percent of sales, compared with 32.2 percent in the prior year. A total of CHF 27.9 million was spent on research and development. As a percentage of sales, this R&D spending came to 17.6 percent. Operating profit (EBIT) was down from the previous year's CHF 8.1 million to CHF 6.4 million. This gives an EBIT margin for 2014 of 4.0 percent of sales, which is also slightly lower than the prior-year figure of 5.3 percent. Start-up costs for new products, as well as currency influences, had a negative effect on the gross and EBIT margins. The changeover to euro-denominated invoicing for Japanese customers, which was initiated some years ago, progressed as planned. On average, 35 percent of Japanese sales were invoiced in euros in 2014; this share will be increased to around 75 percent over the next twelve months. After the financial result and taxes, profit for the 2014 financial year came to CHF 3.4 million, compared with CHF 6.6 million in 2013. Earnings per share stood at CHF 0.12. On December 31, 2014, Micronas reported cash, cash equivalents and short-term financial cash deposits of CHF 151.4 million, a change of CHF 19.0 million on the prior year. This fall is due on the one hand to the investment required for the 8-inch ramp-up in manufacturing areas, and on the other hand to the construction of a combined heat and power plant costing around CHF 5 million. Influenced by the adjustment of pension reserves to the lower level of interest rates, shareholders' equity fell CHF 20.1 million to stand at CHF 109.8 million at the end of 2014. This left the equity ratio at a still solid 36.9 percent. "Micronas met its sales and profit forecasts for financial 2014," says Matthias Bopp, CEO of Micronas. "In addition to negative currency impacts, earnings were influenced above all by temporary start-up costs for new products, all of which were manufactured on the 8-inch line at the Freiburg production facility. For Micronas the switch from 6- to 8-inch production and the launch of new and innovative products are valuable steps towards long-term productivity gains and sustained margin improvements," Matthias Bopp explains. The Automotive segment generated sales of CHF 147.8 million in the 2014 financial year, which is 2.9 percent up on 2013. After adjusting for changes in the euro-yen exchange rate, growth was 5.9 percent. Sales of our Hall sensor products were 5.7 percent higher than in the prior year, or 8.9 percent after adjusting for currency movements. Controller sales were lower overall owing to the discontinuation of the old dashboard controllers, but sales of our new embedded motor controllers were more than twice as high as in 2013. Operating profit (EBIT) for the Automotive segment, which was also influenced by start-up costs for new products, reached CHF 6.7 million in the year under review, or 4.5 percent of segment sales. 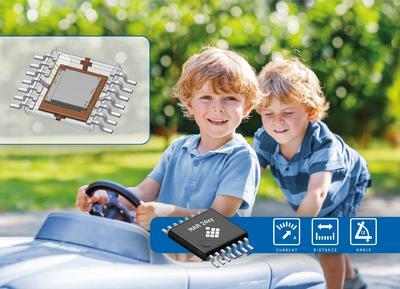 Micronas has the world's biggest portfolio of Hall sensor products for the automotive market. The range was further strengthened during the year under review with the addition of new products that will all be manufactured on our 8-inch line. In 2014 sales by the Industrial segment increased by a pleasing 28.1 percent compared with the prior year, reaching CHF 10.7 million. The segment thus accounted for 6.7 percent of consolidated sales last year. Operating result (EBIT) came to CHF -0.3 million, which includes a one-time impairment of CHF 0.6 million on intangible assets. With the aim of continuing the Industrial segment's development and thus building up a second main business, the internal focus, including in the gas sensor area, was optimized. Owing to the delay in the introduction of a new type of fire alarm, the segment is now concentrating more on supporting our key customers' other ongoing development projects. Capacity utilization at the Freiburg manufacturing plant, which includes both front-end and back-end activities, stood at around 85 percent when calculated over the year as a whole. In terms of front-end operations, 2014 was marked by the move in volume production from the 6-inch to the 8-inch wafer line. This transition will continue over the next few years. The efficiency gains produced by the 8-inch line result from the much higher number of chips that can be produced per wafer; the increase in process costs, meanwhile, is relatively small. The Board of Directors will propose to the forthcoming Shareholders' Meeting that it distribute CHF 0.05 per registered share to Micronas shareholders for the fourth consecutive year. The Board of Directors has also decided to carry out a share buy-back worth up to CHF 20 million. The buy-back program starts in March 2015 and will end on December 31, 2016, at the latest. The shares purchased by the Company can either be used in conjunction with future acquisitions or for treasury management purposes. "The ongoing electrification of motor vehicles will continue to drive demand for the highly efficient control and highly integrated sensor systems used in a growing number of applications," says Heinrich W. Kreutzer, Chairman of the Board of Directors of Micronas. "With the addition to our portfolio of the innovative products announced last year, and with the switch to 8-inch production, we firmly believe that we will increase our growth and earnings, and strengthen our position in the automotive electronics and industrial markets." Following the removal of the minimum Swiss franc/euro exchange rate, the Board of Directors and Management expect sales of around CHF 71 million for the first half of 2015 based on a EUR/CHF rate of 1.05. Expressed in euros, this would represent sales growth of 2 percent compared with the first half of 2014. Owing to the conversion of money held in foreign currencies, a loss is expected at net profit level. The EBIT margin, still influenced by start-up costs for new products, should improve slightly on the year-back figure and is expected to be in the mid-single digit percentage range. This press release contains forward-looking statements, such as projections, forecasts and estimates. Such forward-looking statements are dependent on certain risks and uncertainties which may cause actual results, performance or events to differ materially from those anticipated in this press release. The forward-looking statements contained in this press release are based on Micronas' views and assumptions as of this date and Micronas does not assume any obligation to update or revise this press release. This press release does not constitute an offer to sell or the solicitation of an offer to buy any securities in any jurisdiction. 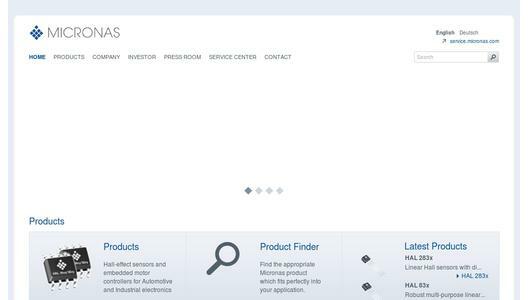 Micronas (SIX Swiss Exchange: MASN) the most preferred partner for sensing and control serves all major automotive electronics customers worldwide, many of them in long-term partnerships for lasting success. While the holding company is headquartered in Zurich (Switzerland), operational headquarters are based in Freiburg (Germany). Currently, the Micronas Group employs around 900 persons.